For film fans, or anyone with eyes and a brain who understands that a good film simply cannot be fully appreciated on a 4x2inch iPhone screen, there is nothing better than seeing a classic on the big screen. I consider myself to be both a film fan and to have a functioning brain and pair of eyes. Imagine my excitement then, when I learned that Kubrick’s 1980 cult horror classic The Shining was being re-released in cinemas in its original 144 minute form, adding an extra 24 minutes of footage never before seen in British cinemas. Kubrick fans rejoice. Not only that, this week also saw the release of Room 237, a documentary which delves into the world of ‘Shining-obsessives’ and the many conspiracy theories surrounding the cult film. Thirty two years after its initial release the film continues to entertain, cause speculation and scare the bejesus out of die-hard fans and first time viewers alike. But just why are we so obsessed with what went on in the infamous Room 237? The Shining is so much more than just a horror film. Initially shunned by critics, the film has since become a cult classic. Kubrick’s adaptation comes from Stephen King’s novel, which the author himself described as ‘just a little story about writer’s block.’ Who would have thought that this little story would warrant a re-release over thirty years after the initial release of its film adaptation as well as an entire documentary dedicated to the conspiracy theories surrounding the film? King famously disapproved of Kubrick’s adaptation, specifically of his casting of Jack Nicholson as Jack, and so chose to collaborate with Mick Garris in 1997 on a TV mini-series that followed his original novel almost to the letter. I haven’t seen the mini-series (and after a quick view of the YouTube trailer, doubt I will any time soon) but needless to say it was not received in the same way that Kubrick’s visual masterpiece was. No blood flowing from the elevators, no freaky twins and no ‘Heeere’s Johnny? The television adaptation appears to have omitted all of the iconic moments that make the Shining the cult classic that it is today: all moments that did not appear in the original novel. The success of The Shining therefore, can be accredited to none other than the master himself: Mr Stanley Kubrick. title) which would soon become one of the most famous moments in cinema history. The lasting impact of the film is everywhere: from its influence on subsequent films to its countless references in popular culture. The Shining is said to have influenced directors such as Paul Thomas Anderson and recent hit tv show Breaking Bad has much to owe to Kubrick. 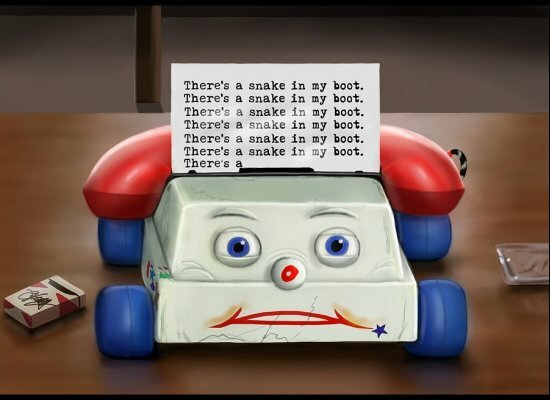 References to The Shining can even be seen in Toy Story. Yes, Toy Story! References to the horror crop up everywhere in the family classic: from a replication of the infamous carpet of the Overlook Hotel to registration plates which read ‘RM237.’ See more : Pixar director Lee Unkrich loves the film so much that he even has his own fan site, of which he assumes the role of ‘caretaker’: www.theoverlookhotel.com. But the film is more than just a fun source of reference for popular culture. Did you know that the film is actually about the Holocaust? Or is it about the genocide of the Native American? Nope, it’s definitely Kubrick’s apology for faking the filming of the moon landing. These are just a few of the outlandish, but extremely well articulated ideas presented in Rodney Ascher’s new documentary Room 237. The documentary consists of a series of interviews from people who can only be described as Shining-obsessives. My recent trip to witness the magic on the big screen was my third viewing of the film. Pretty good going, or so I thought. These are people who have seen the film literally hundreds of times and thus have picked out every possible detail that Kubrick intended us to see. While the average viewer’s gaze is focused on the haunting image of the Grady girls in matching blue dresses, these interviewees are focusing on the meaning of the posters on the wall and the unexplainable layout of the halls of the Overlook Hotel. Whilst listening to the interviewees and viewing their meticulously created graphs and diagrams, it is hard not to believe every word they say, even if their theories do seem at times completely outlandish. All of a sudden, The Shining has become a completely different film from the one you first saw as a petrified teenager. Even thirty years after its original release, the impact of The Shining is clear to see. Whether you’re convinced the film is Kubrick’s apology for faking the filming of the moon landing, or you just kind of want to see Jack Nicholson hacking at a door with an axe, make sure you take this opportunity to see the masterpiece the way it was intended to be seen: on the big screen. The Shining is showing at the Filmhouse until Sunday 11th November and Room 237 until Thursday 8th November.